Composed between 800 and 700 B.C., the Iliad tells the story of the Achilles and other warriors in the tenth year of the Trojan War. The poem tells of the famous quarrel between Agamemnon and Achilles and all that resulted, the extraordinary battlefield accomplishments of the world's most famous warriors and the final encounter between the Trojan Prince Hector and Achilles. The Iliad is the oldest and finest epic poem in Western culture. This book contains a new translation by Canadian Professor Ian Johnston. 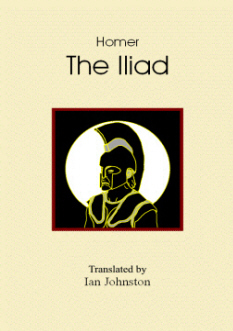 It has been translated from the original Greek into a modern English poetic form and was designed first and foremost for those who will be reading Homer's Iliad for the first time. Here, now, exists a new translation, faithful to Homer's eloquent poetic rendition yet fully understandable by the general reader. Richer Resources Publications is proud to present this new translation by Ian Johnston. For anyone who has ever wanted to read these classics, but were backed off by older English translations, this translation and its companion text, the Odyssey, serve as an introduction to two of the greatest classics of all time.